An earlier seven-tube German set that receives AM, FM, and two bands of shortwave. Gorgeously styled and not too gigantic (23"W x 15"H x 12"D). It's been gone over, failed and failing components replaced, all tubes checked, new antenna wire for shortwave listening. The tuning eye works but is a little on the weak side. 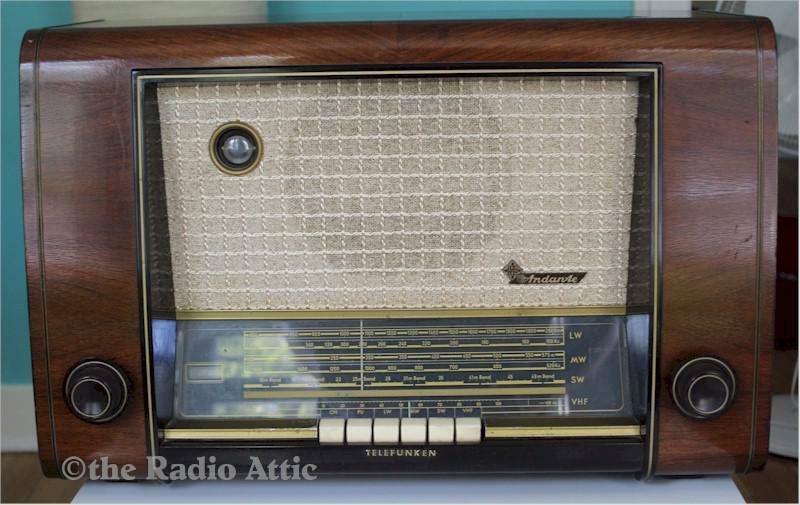 There's a few dings and repaired chips in the finish, a bit of wear on the metal trim, and in general the sorts of flaws commonly found on a 66 year-old radio. It plays well and sounds nice, and is being offered at a very fair price. Please note that this is a heavy set and shipping will be expensive; I recommend Greyhound as the most economical option. It will receive my usual extremely careful and thorough packing job. You are visitor number 714 to this page.